Just as trees and plants harness the energy of the sun, so do solar panels. The photovoltaic cells in the solar panels capture sunlight using semiconductor materials (silicon) and convert it into electricity. this DC (Direct current) electricity is then turned into AC (Alternating current) with an inverter and fed into your home. Solar cells consist of two thin layers of silicon and as the sunlight strikes, electrons within each solar cell are dislodged. The freed electrons can then only return through an external circuit, causing electricity to flow. This electricity is then used to power and supply a solar Inverter. This solar inverter converts this created power and syncs it to exactly match the mains power in your home so you can use it. The power created by the inverter is passed into a Kw meter so you know how much you have generated. This meter is also the one needed for claiming the Feed-in tariff and you will need to send the reading from this meter to your chosen supplier every quarter. Sunlight is present even when the sky is overcast therefore, photovoltaic solar panels will produce electricity whatever the weather. However, the stronger the sunlight the more electricity will be produced at any one time. 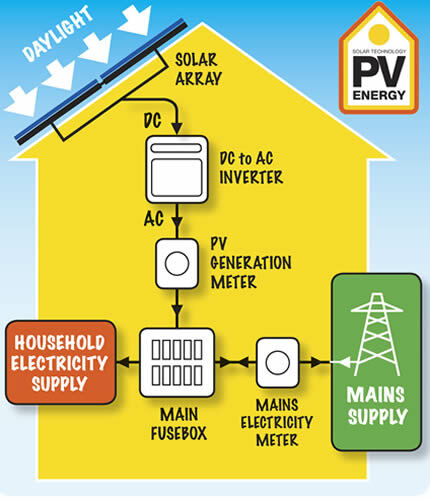 PV solar panels do not produce electricity at night but, because a PV Energy solar system is connected to the National Grid, electricity can be 'imported' to make up the shortfall. Equally, when a PV Energy solar electric system is producing surplus energy it is 'exported' to the Grid earning you extra money.